This week on Equilarium fm ’tis the season to be Jolly and around my kitchen table I will be discussing the transformational magic and wonder of HAPPINESS and JOY with my very special guest Elaine Noble. Elaine is a wonderful Inspirational Life coach, and a passionate ” HAPPINESS Coach” who trained with the magnificent Dr.Robert Holden. She is also a course leader for the “Action for Happiness” foundation whose patron is His holiness the Dali Lama. This December is a powerful 11 Universal month and is the perfect time for us all to focus on what we really wish for most, to explore what our hearts desires truly are, not just for Christmas but for the future. Not just for ourselves or our friends and family but for everyone, for the New Year ahead and beyond. Tis the prime time to manifest our deepest desires and to send PEACE and good will to all men. I will be sharing my latest writing to help uplift and inspire you one and all at this special time of year. A powerful new moon is coming on 11th December and my birthday on 12th So please come join me and lets get the Happiness party started by Raising Vibrations Across the Nations. 2004 DAWN BRESLIN TRAINER running ZEST FOR LIFE w/shops. CPD: Certified Master NLP, Master Results Coach, Master Neurological Repatterning, Master Ericksonian Hypnosis, Life Coach. Member of Mind Valley (Vishen Lakhani) & his Soulvana community. This week I will be taking you further on the very personal journey of my heart, as a visionary artist and author. I will be revealing more layers of myself, sharing more about my Channelled writing and stories of my paintings, plus exciting twists and turns and tales of the adventures towards the manifestation of my vision quest EQUILARIUM. I will be taking you deeper into the various aspects of this altruistic project which is to build a mighty beacon of hope for all mankind. A High Vibration Holistic Healing Centre designed to heal the planet as well as the hearts and minds of humanity. As Masters we must take responsibility for ourselves and the planet we live on. All souls have specific tasks and roles of equal importance and are being urged to unite and merge harmoniously with one another. To use what we have all learned and to bring as much light as possible to where it is needed most. I will be reading my very latest writing to help uplift and inspire as we leap into December with bells on. As Our planet sets the pace, raising Vibrations across the globe we have to join in the dance Raising vibrations Across the Nations. This week I will be discussing what it is to be a visionary artist and author. Speaking form the heart I will be describing some of my paintings and how they reflect different aspects of my life and the emotional journeys of my heart. How they Speak in the silent language of pattern and colour depicting the highs and lows that can affect us all. I will be sharing how my paintings convey a sense of wonder and awe, interfacing current reality and the magical inner realm of all possibility working as visual aids to meditation, where viewers can happily loose themselves and lovingly reconnect to their own source deep within. They are outward expressions of the inner emotional scenery held deep within us all, visual maps that can help people access and navigate their own internal landscapes. I will also be sharing my journey as an author, reading my latest Chanelled writing and other pieces of particular interest and importance to uplift and inspire. So please come and join me raising vibrations across the nations. This weeks show is going to be very exciting as it falls on the powerful and significant day of the master numbers 11:11. This Wednesday also sees the opening of a beautiful 11:11 Portal of Abundance and Manifestation. At exactly same time a Scorpio New Moon arrives in the Heavens, perfectly positioned between the Earth and the Sun. This New Moon represents the prime starting point of all manifestation and the dark sky represents a blank canvas upon which we can create our deepest wishes and realise our wildest dreams! My special guest this week is a dear friend Ann O’Keife who is a gifted Healer, ancient Rune reader, teacher, artist and all round amazing magical woman! She is fascinated and inspired by all aspects of ancient wisdom, personal growth and human evolution. Together we will be sharing my latest guidance and discussing how NOW is the time to clear out all the blocks and anchors holding you back from realising your full potential. So come and join the gathering Raising Vibrations Across the Nations and help inspire all people to become the greatest they can be! Ann O’Keife has a passion to serve, support and inspire. She is a solution focused therapist, healer, rune reader, teacher and artist. She is fascinated and inspired by personal growth and human evolution, symbolism and the natural kingdom. Her own personal journey began after a deeply prophetic experience in 1994 around Easter time in Glastonbury UK. She was introduced to the ancient Rune stones, 24 angular symbols that are over 3000 years old and it felt as if she had re found long lost friends! This ignited her desire to learn and study as much as she could about the mind, body and soul connection. After qualifying as a reflexologist in London, she relocated to Brighton in 1999 to co-run a health store. Her yearning to learn grew; She studied Indian head massage, Healing, Counselling, Talking therapies and meditation techniques. It was during this early expansive time that Ann met her teachers Bob and Lee Nitsche of the Wolf clan, Seneca people. Their teachings of love, respect, dignity, integrity, understanding, gratitude, harmony and service are the guidelines for her life and work. 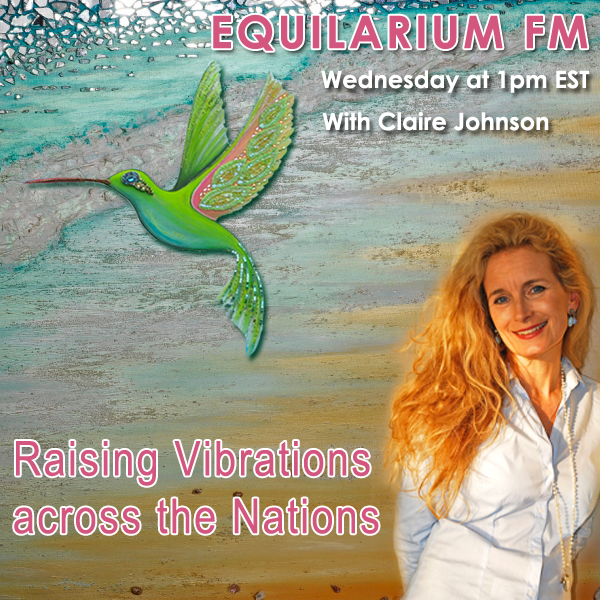 This week our special guest on EQUILARIUM FM is a very inspirational, successful healer and business woman Mo Froud the award winning acupuncturist and beautiful sister of our very own Josephine Tyrrell. Mo has an absolute passion to empower her patients to rebalance all aspects of their health and well being through a combination of acupuncture, Chinese Medicine, and Healthy Holistic Living. She has a wonderful warmth and open hearted approach to life and all her patients. She has recently accomplished astonishing results with fertility at her U.K. clinics bringing the amazing gift of New Life to many very very happy couples. Together we will be discussing the joys of embarking on the path of a healing career and what it means to cross from the know into the unknown in the pursuit of walking your true walk and darling to talk your hearts true talk! I will also be sharing my latest writing to uplift and inspire us all to leap forward and to fully embrace the NEW. So please come and join our gathering as we Raise Vibrations Across the Nations. With co host Josephine Tyrrell. I have a passion to empower my patients to re balance all aspects of their health through a combination of Acupuncture, Chinese Medicine and Healthy Holistic Living. I look at diet, lifestyle, work life balance, exercise, ways to move and strengthen your energy and offer strategies on how to calm the monkey mind. My patients are usually women but not exclusively. I offer Holistic Gynaecology. I help to rebalance problems from the onset of periods with issues such as PMT, painful or irregular periods, PCOS, endometriosis, fertility, pregnancy and through the varied stages of a women’s life. I also help to transform the misery of menopause those annoying night and daytime sweats, the moods swings , lack of energy, insomnia, palpitations and much much more. Fertility and pregnancy is my speciality and my passion. It is such a rewarding experience to support couples on their journey to becoming parents. I teach them how to reconnect with their bodies and to understand their body may be out of balance rather than broken. I work with couples who are trying to conceive, whether in support of IVF or if they want to use acupuncture and Chinese medicine as a holistic solution to bring the body back to balance to help them conceive naturally. I am a Zita West affiliated acupuncturist. If you would like to have a chat about how acupuncture can help you on your journey back to health and balance, or book in a consultation and treatment. Mo has a BSc (Hons) degree in Traditional Chinese Medicine and Acupuncture and is a member of the British Acupuncture Council MBAcC. This week Real Holistic Housewives will all be away on an exciting adventure in the Highlands of Scotland. Following in the steps of the Da vincci Code we will be traveling to Edinburgh and exploring the wonders and mysteries of the famous Rosslyn Chapel. We will be speaking to the incredible Stuart Mitchell who has recently discovered the hidden harmonic codes embedded in the fabric and pattern of the building. Rosslyn’s ‘Lady Chapel’ is (basically) a 15th Century “CD” with the harmonic information carved as specific patterns out of stone as an ancient/natural way of recording sequences of pitch/frequencies. Today this system is called ‘Cymatics’ which is natures beautiful “resonant notational system’, a music system and language that visually display’s the frequency of pitch in amazing geometric patterns and are inherent in the fabric of nature. I will also be sharing my latest writing to guide and inspire us all. So please come and join the gathering as we Raise Vibrations Across the Nations from Bonny Scotland. With my beautiful Co Hosts ~ Gill Orsman, Josephine Tyrrell, Anita Wisdom and Carmen's Veztergorm. Stuart Mitchell was born in Edinburgh and began to learn the piano at the age of five. His father is the jazz pianist and composer Thomas J. Mitchell and this influence and guidance has been invaluable to Stuart’s music. Stuart studied and performed music all over the world for 20 years as a music director for such artists as Shirley Bassey and Rita Coolidge. 2005 saw Stuart’s first major classical CD release of his score Seven Wonder Suite for Orchestra, performed by The Prague Symphony Orchestra, The Kuhn Mixed choir and conducted by Mario Klemens. This work also received its premier in Prague in 2006 performed by the Czech National Orchestra. In 2006 Stuart and his father discovered music in Rosslyn Chapel of the ‘Da Vinci Code’ fame connecting the music to the science of Cymatics. In 2008 Stuart released the first in his series of works called DNA Variations, music translated from Ancestral DNA sequences of various species. Stuart’s current projects include: Grounded Motion Picture Score and Production, The Song of Eve, The Human Genome Music Project released in October 2014. This week around my kitchen table the Real Holistic Housewives will be discussing what it means to be living an authentic life with awareness and empowerment. We will be sharing our magical experiences and stories of self development and enlightenment with our special guest renowned Intuitive Medium, Reiki Master and Spiritual Coach Shelly Wilson. What it is to be a Visionary and Way-Shower in the 21st Century, the challenges and opportunities, the missions and roles we are here to fulfill. We will also be sharing my latest writing to guide and inspire us all. Please come and join the gathering as we integrate Spirituality into everyday reality with joy and laughter, Raising Vibrations Across the nations. With my wonderful co hosts Gill Orsman, Josephine Tyrrell, Anita Wisdom and Carmen Vesztergom. Intuitive Medium, Reiki Master and Spiritual Growth Coach Shelly Wilson would love to assist you on your spiritual journey. With respect, truth, integrity and love, she honours your free will and recognises that you are co-creating your reality with the Universe. Shelly’s books, 28 Days to a New YOU, Connect to the YOU Within and Journey into Consciousness, are available in paperback and eBook. Shelly has studied with Sonia Choquette, Lisa Williams, James Van Praagh, John Holland and Tony Stockwell and is a certified Karuna© Reiki Master through the International Center for Reiki Training. In addition, Shelly is a featured columnist and an Executive Editor for OMTimes Magazine. This week around my kitchen table the Real Holistic Housewives will be discussing the heroes journey of an ordinary girl with dreams and visions of finding romance, love, magic, and adventure with our beloved friend, internationally acclaimed artist and fellow Global Ambassador for Peace and Enlightenment, Ginger Gilmour. Ginger will be revealing her own magnificent journey as we celebrate the release of her wonderful new book “The Bright Side of the Moon”. A true story of how a child of adventure became a world traveler, a mother, and a seeker on a magnificent path with the band called Pink Floyd (and beyond), to discover the living God in a most unusual and unexpected way. We will be sharing stories of our own journies, tales of triumph over adversity, of finding courage and strength to follow our dreams and to guide and inspire others to do the same. I will also be sharing my latest writing to lighten and brighten the way down the yellow brick road of everyday life. So come and join the gathering with lively conversations and laughter as we Raise Vibrations Across the Nations. With my beautiful Co Hosts ~ Gill Orsman, Josephine Tyrrell, Anita Young and Carmen Veztergorm. Memoirs of the Bright Side of the Moon. A woman’s journey of Love, Pain & Return to God. -Pink Floyd’s David Gilmour and Ginger Gilmour married on a bright sunny day in England during the recordings of “Wish You Were Here”. This book is a collection of stories told by Ginger Gilmour in her own words titled “Memoirs of the Bright Side of the Moon“. It consists of 653 pages with 140 photographs as she walks us thru 90 individual chapters of her life … glimpsing her heart as you meander down the hallways of her life, pausing & peeking inside a closet or two. A romantic journey that takes you to secret beach hideaways in the Greek Islands to a remote middle eastern village where the likes of Mick Jagger, and the Rolling Stones frolic in a hidden world unknown to fans. A life that crossed paths with George Harrison, Pete Townsend, Jimmy Page, Eric Clapton, Joni Mitchell, Timothy Leary, Bette Midlerand Graham Nash including Christmas with Paul and Linda McCartney. The list goes on and on. In this book the reader will get to know Ginger Gilmour and her personal life. It will go beyond anything you have ever imagined and as truthful as her heart could bear. “This is one of the greatest stories ever told,” says her editor Cathy Holmes. “The process was an amazing event to watch as the book unfolded one page after the other,” She chimes. There are those who think the book too personal but Ginger wanted people to know the real story of what those historic days of Rock ‘n’ Roll were about without necessarily being a tell-all. This book is Ginger’s personal way of thanking David and the Floyd for such a wonderful adventure-filled life. Ginger is available for print, radio, television and SKYPE interviews. This week around my kitchen table the Real Holistic Housewives will be discussing the natural power of Attraction, Magnetism and Nutrition. We will take you on a journey from ill health to well being and beyond ~ With special guest Nikki Edgell who will be sharing how we can all Radiate Vibrancy by eating natures bountiful harvest and living in harmony with Earths magnetic energies. With my beautiful Hosts ~ Josephine Tyrrell, Anita Young and Carmen Veztergorm. I have a passion for sharing my knowledge and so write articles, give talks and run short cookery courses in nutritional healing. You can also join my discussions on facebook and twitter. I work under the principle that wellness depends on a balanced approach to living, in all areas of your life: your body, mind, family, community and financial health all have an impact on your wellbeing. A healthy home environment is a vital support for your health and so I recommend the Nikken Wellness Home. This week around my kitchen table the Real Holistic Housewives will be joined by our special guests Ann-Marie Marchant and Helen Thatcher the founders of “Vital Attraction” a process which combines the “Laws of Attraction” with “Vital Development” a movement based practice which enables us to explore and expand our range of emotions. Together we will be discussing how this powerful process has evolved and how using it can bring extra well-being and happiness to everyday life. I will also be sharing my latest Thoths teachings to inspire and encourage everyone to shine as brightly as possible and to add their own uniqueness to the collective radiance! So please come and join the gathering with lively conversations and laughter as together we Raise Vibrations Across the Nations. With my beautiful Co Hosts ~ Gill Orsman, Josephine Tyrrell, and regular guest Carmen Vesztergom. Ann-Marie and Helen started working together in the spring of 2014 when they ran there first retreat together in Sussex. It was a great success and effortless and they loved the spark and inspiration that they created as they worked together. Vital Attraction combines the Laws of Attraction and Vital Development and offers a clear way to be free of the old limiting beliefs and stories to then truly embrace and create a powerful, inspirational, natural and joyful way of living & being. Ann-Marie and Helen are devoted to seeing each person as whole and encourage individuality and self expression and now offer workshops, talks and retreats. There next step is to help those within the work place to feel less stressed and to enhance their working environment using the principle of vital attraction.